www.Carlarjenkins.com has had its highest pageviews ever in its history according to Google Analytics. This is not a mirage but a testament to great content strategy, target marketing and pivoting on expertise. 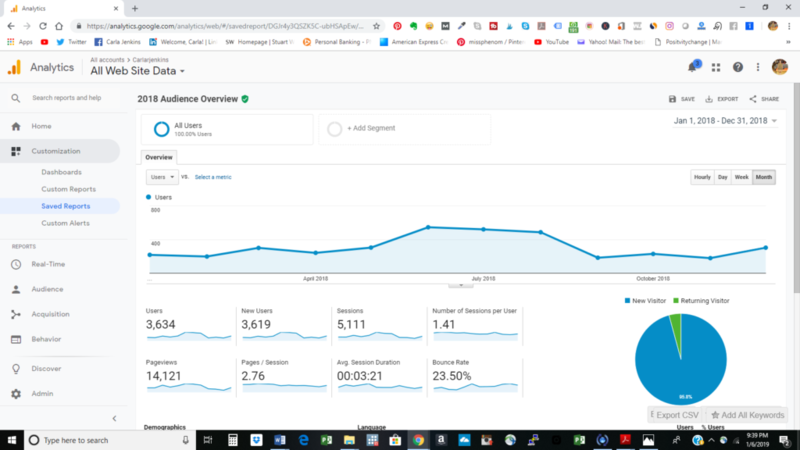 Below are the 5 reasons why www.Carlarjenkins.com has had its highest pageviews in 2018. Let’s face it: content is king! No matter how banging your graphics are, no one will return to your site time and time again if you don’t have great content. In 2015 when I started writing on LinkedIn Pulse, I promised myself to never write any fluff. After 3 ½ years of fulfilling that mantra, www.carlarjenkins.com has over 14,000 pageviews. I have been consistently doing this since July 2015. 3 ½ years later www.carlarjenkins.com is in the Alexa Majestic Million. These numbers come from consistently overdelivering in the content department. Throughout these years, there have been times where I have had writer’s block and don’t feel like doing it; but, I overcome these obstacles and soldiered on delivering my content to my audience. My consistency has resulted in my securing a guest blog post with the Resilient Recruiter. When you show up every day, people notice. This is something that I have been made aware on the summer. I was on the phone with a branding expert. The conversation turned to people in the project management space. When I casually mentioned another black female project manager, he responded by saying that ‘he knew quite a few people but I was the only person he knew in project management.’ Even though I wasn’t where I am now, his comment amazed me at how my reputation preceded me. Taking a page from Netflix and branded content where you release a season of shows in one day, I have serialized my spring cleaning series. I ran that in March and April resulting in five of my spring cleaning articles received over 1000 pageviews. People want a series (or collection) of related content. I deliver this to them and was rewarded with thousands of pageviews. In 2018, I started off with three foci: social media, personal branding and project management. However, throughout the year my target shifted based on the responses I received. I noticed that my Project Management Professional (PMP) stories received more views so I pivoted upon that. See, project management is a very large field. Focusing on PMP is allowing me to share my expert knowledge with a willing demographic who will read everything that I offer on www.carlarjenkins.com. I had two significant milestones: celebrating my 5-year PMP anniversary in June and renewing my PMP certification in November. In June, when I shared my anniversary news with others in relevant project management LinkedIn groups, I received hundreds of likes and video views. I reached out to them to inquire about their PMP pursuits building my LinkedIn followers past 2000. In October, I created a PMP renewal docuseries where I showcased my recertification journey. When I unboxed my new PMP certification, that video received over 1000 views. These two events resulted in my highest pageviews and re-centered www.carlarjenkins.com to focusing on PMP certification and lifestyle. Men lie. Women lie. Numbers don’t. And these 14,121 pageviews come from my ability to deliver high quality content consistently with my target audience who rely on my expert. You want the same result get in touch with me here: www.carlarjenkins.com/bookasession.